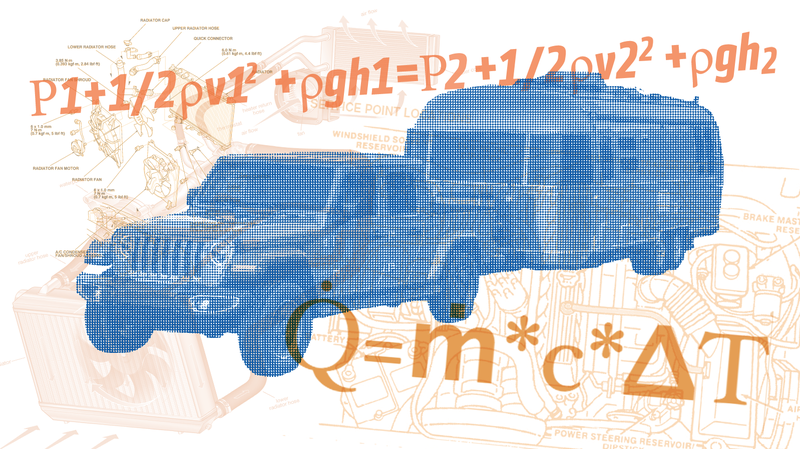 Right now, auto writers are in Sacramento, California testing the 2020 Jeep Gladiator, and while driving impressions are embargoed for a bit longer, there’s a great story to be told about how Jeep engineers managed to get the truck to tow a best-in-class (for a gas vehicle) 7,650 pounds—and why the upcoming diesel will actually tow less than the gas model. “Best-in-class” is a term that automakers love to throw around, especially when advertising in the highly competitive pickup truck segment. So it’s no surprise that, as engineers were developing the 2020 Jeep Gladiator, word came from the top of the company that the Jeep truck had to be ahead of the competition when it came to towing. There was no second place option. The thinking behind this mandate, as the Gladiator’s chief engineer Pete Milosavlevski—or Pete Milo for short—told me in an interview during the press launch, was that, since Jeep had been out of the truck market for so long, it was important to make it clear that the Gladiator was a legit pickup by offering more than just middle-of-the-pack performance. The first Jeep pickup in 28 years had to come out of the gate red hot. “You got to come forward with a credible truck,” Milo told me. The only issue was, engineers were having a tough time creating a cooling system using the Wrangler’s front end (which the Gladiator shares) that could handle best-in-class mid-size truck loads. “We got stuck at 6,000 pounds,” Milo told me—a fact that I myself knew all too well, as between 2013 and 2015, I was the Systems Integration Responsible in the Advanced AeroThermal team doing cooling system development on the Wrangler and Gladiator. The problem was packaging; the Wrangler’s unique front end design and its strict off-road requirements essentially “boxed” engineers in, limiting how big the radiator could be. I don’t quite remember what was stopping us from adding thickness to the radiator, but presumably interference with the grille and with underhood components was the limiting factor, and because the JL program’s hood length had actually already been significantly extended during development, further extensions weren’t really considered feasible. As for adding height to the radiator, this was limited by the hood line, whose location had been set in stone early in the program. Not to mention, changes to the hood height weren’t really an option because of potential implications for pedestrian protection, Milo said, and also because of affects on styling and downward visibility. Designing a taller hood specifically for the JT would have significantly reduced how many components could be shared with the JL, and that would mean added cost and manufacturing complexity. “We wanted to minimize the tear-up as much as we could,” Milo told me. While the cooling module’s height in the upward direction was limited by the hood position, dropping the cooling module below the bumper was also a no-go thanks to the vehicle’s strict approach angle requirement, and the need to keep vulnerable components well away from terra firma. Balancing cooling requirements with off-road performance was a key challenge, Milo told me. So, thickness and height were locked in, but what about width? What was stopping engineers from stretching the radiator outboard? The Jeep Gladiator’s hydroformed rails limited how wide the cooling module could be. One thing you notice when sitting in the Jeep Gladiator is just how narrow the nose is—presumably a styling decision meant to visually “connect” the JT and the Wrangler on which it is based with Jeep CJs of yore. Those hydroformed rails could not move to accommodate a larger cooling module, as they were important structural components that had been established in the beginning of the JL program, and they carried with them critical crash safety implications. “We didn’t want to significantly change our front impact strategy,” Milo told me when discussing the heat exchanger packaging constraints in the lateral, cross-car direction. So that was the big struggle—engineers had only a small space bounded on top by the hood, on bottom by the approach angle, and on the sides by the two hydroformed rails. The radiator just couldn’t grow. But of course, there’s more engineers can do to help keep an engine cool while towing 7,650 pounds up Davis Dam at 100 degrees Fahrenheit (these are the conditions of grueling trailer tow standard, SAE J2807) than simply enlarge the radiator. Improving heat exchanger efficiency, I recall, is another “lever” that engineers considered, as was upping coolant flow and airflow. I vaguely remember that coolant flow through the radiator had already reached a point of diminishing returns, so my team in AeroThermal focused on airflow. And on that front, there was a decent amount that could be done. We worked to reduce leaks in the seals (pointed out in the FEM image) that make sure air “funneled” through the heat exchangers and not around them, we worked on optimizing the spacing of the fan relative to the heat exchangers (but this fore-aft space, as previously mentioned, was highly limited), we ran studies on various fan wattages and blade profiles, we worked with the chassis team to see if there was any way to reduces the size of the braces on the FEM while still meeting structural requirements, and we frequently asked the scarf-wearing artisans in the Product Design Office if they’d widen the grille slots. The team also tried some more out-of-the-box (literally, in this case) ideas. While encroaching upon the approach angle was not acceptable, there was a bit of dabbling under that bumper. “We talked about packaging some additional cooling below,” Milo told me. One of those ideas, I recall, was an air duct built into the lower belly pan (shown above) that essentially “scooped” oncoming airflow up into the radiator. During my time at FCA, we asked the prototyping lab to 3D-print an SLA model of the part, which we had technicians bolt onto the outgoing JK Wrangler (Early on in development, JKs were used to test parts for the JL, and in many ways, it served as the basis for many of the JL’s designs). One of the concerns with this belly pan duct was “mud pack,” which is exactly what it sounds like: Will this duct fill with mud when you’re offroading, and will that mud then render the scoop useless? By the time I was done screwing arou—I mean, doing official engineering validation—we found the duct to be clear of mud. Whatever had gotten in had just slid out—maybe if we’d driven through thick enough, deep enough slop, we might have gotten some to stick, but in any case, it looks like the idea—which, as I recall, really didn’t yield a ton of additional airflow anyway—was scrapped. If you look at the new Jeep Gladiator, there’s no duct in the belly pan, and yet, Jeep was still able to achieve a tow rating way, way beyond the 6,000 pound “barrier” imposed by the packaging constraints. Seven thousand six hundred and fifty pounds is the top of the gasoline pack, and to get there with that front end is—from the view of someone who toiled hard with some really smart engineers for months to try to make that happen—a tremendous achievement. I will note that, a lot likely changed on the JL and JT after I left, so some of the roadblocks holding engineers back at 6,000 pounds likely disappeared as the design progressed and data fidelity increased, but Milo told me that key actions that helped Jeep reach the top of the class in towing were opening the grille up and optimizing the tire size and gearing. You’ll notice that the Jeep Gladiator’s towing capacity varies based on trim level, gearing, tires size, and transmission type. Part of this has to do with the fact that different options can alter what’s called “Vehicle Demand Energy”—in this case, how much power is required by the engine to get the truck up the SAE J2807 Davis Dam grade given a certain vehicle load. The 3.6-liter “Pentastar Upgrade” engine in the JT can meet this power requirement by running at a variety of different operating points (RPM, load points). In other words, let’s say the power needed to tow 7,650 pounds up Davis Dam is 200 horses—this could be achieved in third gear at a high engine RPM but low load (which relates to throttle opening) or in fourth gear at a lower RPM but a higher load on the engine. Transmission gearing, axle ratio, tire size, and of course transmission calibration are all factors that play into which gear the vehicle can hold up the grade, and thus, which operating point the engine will run at while towing a certain load up Davis Dam. That’s a big deal, because an engine’s heat rejection (and also the heat rejected by other components in front of the radiator, like a transmission cooler or charge air cooler) is not the same just because the engine is making the same horsepower—it is a function of engine speed and load. So to achieve 7,650 pounds, Milo told me a major enabler was optimizing the tire size along with the gear ratio, with the team ending up choosing—for the Sport trim with the Max Trailer Tow group—a 32-inch tire and a 4.10:1 axle ratio to keep heat rejection down. (That’s the same gear ratio as the Rubicon, and while the Sport trim doesn’t get the 4:1 low range in the transfer case, that short axle ratio should still be exciting to folks interested in buying a less expensive Gladiator to build up with larger tires). The actual slot widths appear to be the same, allowing Jeep to use a common grille between the two models, but the texture inserts inside the grilles are vastly different, with the JT’s being less restrictive allow for better airflow to the cooling module. So those were the main enablers according to Milo: the bigger fan, the big grille openings, and the optimization of heat rejection up the grade via the axle ratio and tire size. Together, those were key parts of getting the Jeep Gladiator the highest tow rating of a gas truck in the mid-size segment, even out-pulling the gas Chevrolet Colorado by 650 pounds, which has a significant lower grille opening. Clearly it can be tough to design a cooling system that can handle towing, but that, at the same time, doesn’t compromise approach angle, and that’s why the 7,650 pound rating on the Gladiator is so impressive. The rating is only 50 pounds shy of the 7,700 pound number on the Colorado Diesel, but the off-road variant, the Colorado ZR2 diesel is limited to the same 5,000 pound rating as the gas, presumably because of the lack of the lower opening. Speaking of diesel, we don’t know what the upcoming Gladiator diesel will be able to tow, though Milo did tell me over dinner that it will be less than the gas model. I asked him to expound upon that during an interview the following evening, but Jeep’s PR rep made it clear that all the company was releasing was horsepower and torque figures, which are 260 HP and 442 lb-ft, respectively. Milo did give me a hint, though: charge air cooler. This has to be packaged somewhere, and because of the Gladiator’s off-road requirements, and the unique way its front end is designed, I’m assuming that heat exchanger will be right in front of the cooling module stack, blocking airflow to the radiator and rejecting heat into air meant to cool the engine. It will be interesting to see if Jeep can beat the Colorado ZR2 Diesel’s 5,000 pound figure. Between the suspension changes and the truck’s wheelbase, the Gladiator, Milo told me, is better able to meet the handling and stability portion of the SAE J2807 towing test, particularly in the areas of trailer sway and understeer performance. I mention this because I’m sure folks are wondering if they can just modify their JL Wrangler with cooling/axles/tires from a JT and be able to tow 7,650 pounds without overheating—the answer, Milo told me, is yes, theoretically, but because there’s more to towing than just cooling—particularly dynamic implications—you probably shouldn’t. So that’s it—no driving impressions until later, but now you know just how hard it was for Jeep engineers to reach that tow figure, and also why you should expect the diesel to tow less.